Made up of 18,000 islands, Indonesia is home to many unique people. Perhaps not as visible as people living under the six recognized religions in the country, of which citizens have to pick one and can only marry outside of their religion if one person converts, are the many tribes that inhabit some of those islands. Let’s take a look at some of those fascinating folks! With all the zombie fiction that exists today, it’s not surprising that some have gone on to take it all a little too seriously… but what if those people had no access to any media and up until about 1970, believed they were the only people that existed. Living high above the forest floor in treehouses (which are also used to mark the passage of time), for fear of “walking corpses” at night below, the Korowai are cannibalistic, while also being hunter-gatherers. Numbering 3,000 people, the tribe is expected to vanish with the next generation as more and more young members leave for Dutch missionary settlements. 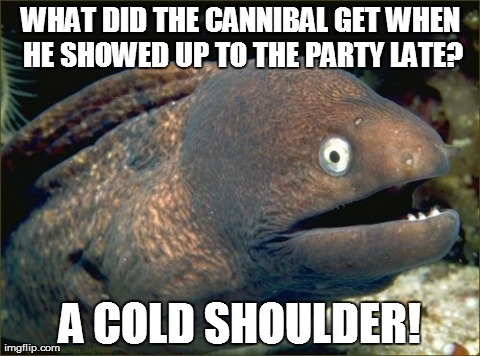 Fellow cannibals (not of the Fine Young variety! ), the Asmat had a feared reputation as headhunters and just being scary folks. Any explorers landing nearby would be met with loud noises and explosions of white powder, causing them to flee. The group (with a population of 70,000) is famous for their woodcarving, which is collected worldwide, even bringing Michael Rockefeller (yes, of that Rockefeller family) to Indonesia. When Rockefeller disappeared, the Asmat were launched into the public eye and given their way of life, you can only assume what happened to Rockefeller’s never-discovered body. Called Sea Dayaks (I think they were trying to be derogatory) by British Colonists, this tribe was constantly at war with other factions and were known for headhunting, both acts necessary for life on an overcrowded island. The skulls collected by Iban warriors were regarded as their most-prized possessions. The people also took a lot of stock in jars and brass instruments, which they believed depicted wealth. Today, the Iban have largely evolved. Although some still live in traditional longhouses, these homes have been equipped with modern technology and utilities. At average heights of under five feet, the Yali are officially recognized as pygmies. If you want to visit the Yali, you better be prepared for an arduous journey through treacherous trails that wind through the Jayawijaya Mountains. 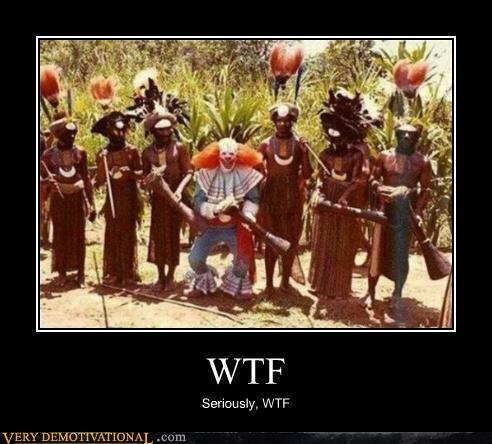 Once you get there, things may not get much better, as the tribe also has a history of cannibalism, going so far as to grind their victims bones to dust, ensuring they would never return. That said, the tribe’s women get to live in their own houses, while the men reside in communal homes. Each family has their own vegetable garden, so they do have that going for them. Yet another group of ferocious warriors, who had to constantly fight to hold their land, thought to be the most fertile on the island. Unlike others, the Dani were not cannibals, but they are unique for turning their most honourable chiefs and warriors into smoked mummies, which they gladly put on display for visitors to the tribe. Also, after an enemy was killed, the Dani would engage in a two-day dance-a-thon, showing off weapons and other possessions taken from their victim(s). Sweet potatoes are used as currency, for trade and dowries by the Dani, so make sure to pick up some packs of yam fries before heading to Indonesia. The Mentawai are easily recognizable thanks to their heavily tattooed bodies and sharpened teeth, which they do because they believe it makes you beautiful and elegant. I’m not sure vampires would agree, but they can’t even see themselves in mirrors anyway! The tattoos are used to record age, social status, and profession. Children receive their first tattoo at 11 or 12 years old on their upper arms. Then, at the age of 18, tattoos are added to the thighs. Finally, the rest of the body, head to toe is tattooed. The tattoos are important for Mentawai afterlife, helping tribal members recognize family based on the designs. As people around the world prepare to celebrate the coming of the New Year, another unique Indonesian custom should also be noted: Hindus living there celebrate a Day of Silence, which includes no work, travel, electricity, entertainment, talking, or eating. This causes the streets to empty, the airport to shutdown, and tourists to be restricted to their accomodations. Only emergency vehicles carrying passengers with life-threating issues and women in labor are allowed. What a perfectly titled cocktail to end the Around the World project, of which I have greatly enjoyed! And we went out with a bang, as this drink is very good, warming the body and soul. 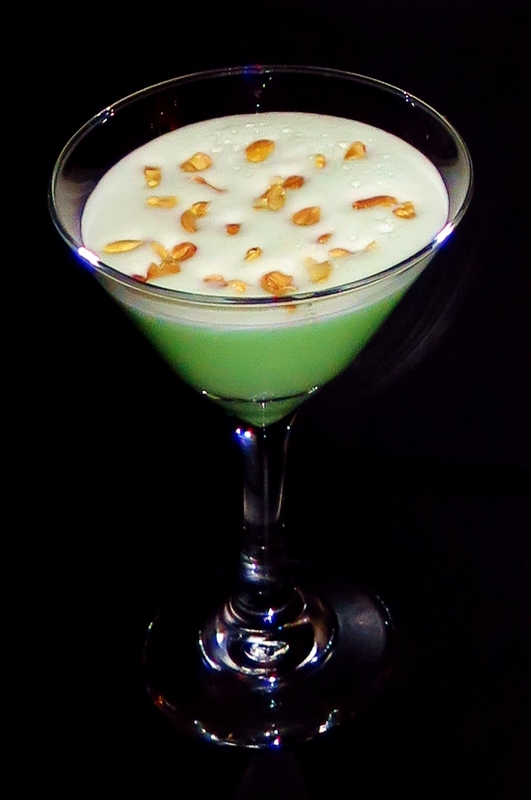 How can you go wrong with combining bananas (Pisang Ambon) and nuts (Frangelico)!? The Crushed Peanuts for garnish were a nice touch for a snack to go along with the martini.